The ACR-MRI Phantom is an 8" (203.2 mm) diameter cylinder, 6.82" (173.40 mm) tall with various fixtures inside, including a grid, cylinders and other points of interest. Marked with reference points for nose and chin. 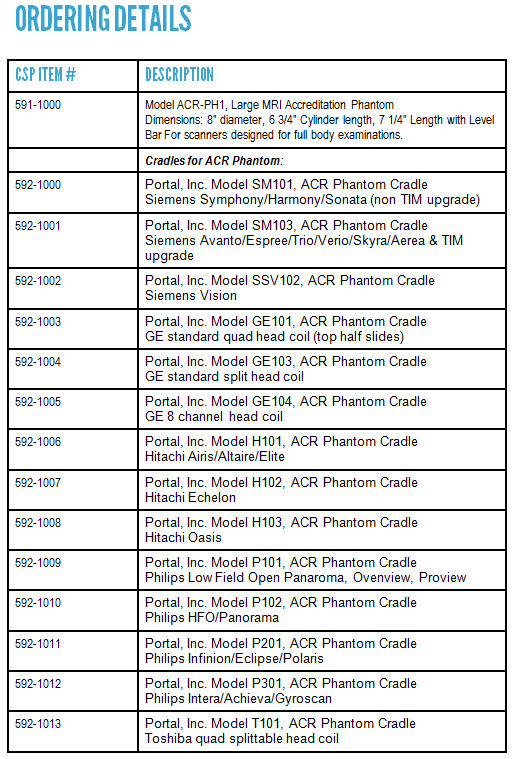 The Phantom is approved by the American College of Radiology and is compatible with the ACR Phantom Cradles listed below (sold separately). The MRI Phantom Cradles for use with ACR Phantom. Beginning August 1, 2002 the American College of Radiology (ACR), as part of its Quality Control program, began requiring ACR accredited MRI sites to calibrate their MRI units on a weekly basis. ACR has introduced a head coil phantom designed and produced specifically for such calibrations. However, the ACR phantom is not compatible with other phantom cradles, nor does ACR produce such a cradle for the ACR phantom. This has left MRI technologists around the country to use various rudimentary devices to attempt to accurately position the ACR phantom and has resulted in a lot of wasted MRI time - with such positioning often taking as much as an hour to complete. These MRI Phantom Cradles solve the ACR phantom positioning problem. Available compatible with most GE, Siemens, Hitachi and Philips MRI’s.